Mrs Marjorie Godfrey (nee Harper) graduated in Arts from The University of Queensland in 1936. She shared her memories of her time at UQ with Luciana Arcidiacono, who graduated from UQ in 2016. One memory she shared with us was the requirement for students to wear academic dress when they attended lectures, adding that, “going to a lecture without academic dress you would be called ‘academically naked’”. Mrs Godfrey was among one of the first women to graduate from the University of Queensland. She recollects there being approximately 20 other women at UQ during her time, with popular degrees being Arts and Law. 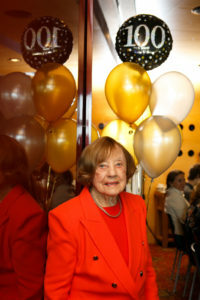 “There were not a great number of women doing degrees… And you knew most of them.” Mrs Godfrey laughed when she shared another memory, “I knew one woman who enrolled in ‘History 1’ every year so that she could come for the social life”. When asked about her original motivation to attend university, especially during a time when few women attended, Mrs Godfrey responded, “I think my mother didn’t want me to marry a cotton farmer. She was very keen to get me out of the district, and she worked very hard”. As a driven and determined student who enjoyed both the social and academic aspects of University life, she was also a keen hockey player and became an inspiration for women’s education. On graduating, Mrs Godfrey become a high school teacher. In a long and successful career she worked at a number of schools, including Commercial High, and the Anglican Church Boys’ Grammar School. Mrs Godfrey also held the role of Principal Mistress at Cavendish Rd. State High School). In 1967 she began private coaching for students at her home—a job she continued until she was 89 years of age. Marjorie Godfrey, Bachelor of Arts 1936, Brisbane. Alumni Friends of The University of Queensland congratulate Mrs Godfrey on the occasion of her 100th birthday (September 2016). Alumni Friends would particularly like to thank Mr John Godfrey for his kind help in sharing information about his mother, and for arranging for a meeting with Mrs Godfrey. We are most grateful to Mr John Godfrey, and to Mrs Marjorie Godfrey, for taking the time to share their memories of The University of Queensland—and also thank Luciana Arcidiacono for writing this story. Thanks also to Dominic O’Donnell, who produced a short video of the interview. This entry was posted in Family and tagged 100, 1930s, Hockey, University Blue, UQ Sport, women in education. Bookmark the permalink.